Action will be held as demonstrations, pickets and flash-mobs in different cities during 7 days. The goal of this action is to draw attention to the terribly unjust adjudication - 3 years in prison, that Eugene Vitishko got for protecting nature. The RSEU has adopted a Statement on the Eugene Vitishko. On 20th of December Tuapse regional court granted the request of executive inspection to change the punishment for Sochi ecologist, a member of the Council of Environmental Watch on North Caucasus, Eugene Vitishko. Court changed the punishment from conditional condemnation to the actual custody and sentenced Vitishko to three years in a penal colony. Members of the Environmental Watch on North Caucasus Eugene Vitishko and Suren Ghazaryan in 2012 were sentenced to three years probation for «damaging» the fence around the territory of state forest fund, that presumably walled the cottage of Governor Alexander Tkachev. Dismantling sections and drawing labels on the fence, installed according to environmentalists illegally , were classified as "hooliganism». Suren Ghazaryan was forced to leave the country because of the prosecution and was granted political refugee status, which once again prove the political character of environmentalists persecution. What was the real reason for the change of punishment for Eugene Vitishko? The fact is that in November 2013 Eugene announced EkoVahta report on the consequences of Sochi Olympics for nature. Eugene Vitishko tried to draw public attention to the fact that for holding the Olympic Games Russian legislation was changed so that it became possible to destroy the reserves for the Olympic construction. These changes have fatal consequences not only for the nature of Sochi, but also for the nature of Russia . It turns out that the Sochi 2014 Olympic Games were only excuse for the destruction of nature and environmental legislation of the Russian Federation . Eugene Vitishko situation shows that anyone honestly protecting the nature of Russia may end up behind the bars. If we won’t unite to help Eugene Vitishko today, tomorrow prisoners like these would be ten times more. If you don’t agree with the unfair sentencing of Eugene Vitishko, you can join the campaign on his defense in the period from 28 February to 7 March. As the experience of international solidarity campaign to protect Arctic Sunrise, such joint actions truly effective and lead to positive results. 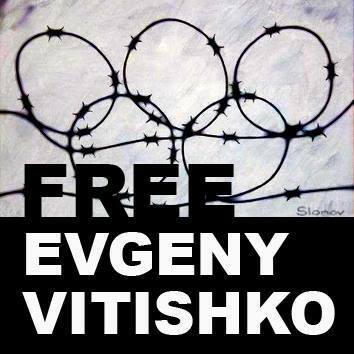 Come out on the central squares of your cities to demand the release of Eugene Vitishko. The more towns will join the action, the more chance that we will be heard and Eugene Vitishko would be released.